Will Social Media Help You Quit Smoking ? It takes a village…to help someone break an addiction. In this digital era, we are fortunate to have that village available at our finger tips: social media. The power of social media – a relatively new technology – has yet to be fully harnessed. As more and more people and companies engage and interact with each other using this form of communication, we collectively realize and learn that it holds the potential to influence our thoughts and ideas concerning the way in which we choose to spend our time or money, how we talk to one another, how we learn, or how we support each other. And it is being proven over and over that it can do this at a speed and scale previously unimaginable. For any business including healthcare, there is a lot of opportunity to reach a larger audience. And for those of us with poor health habits like smoking, this can be a game changer. We know that peer pressure and social image are effective tools to influence others. In fact, the tobacco industry exploited this fact in the beginning. With social media, the tables are now turned. We can use the same tools to guide people on the path to smoke-free living. Social media can be another powerful support tool for people, especially the young, who wish to end the tobacco smoking habit. Of course, we don’t know for sure if social media can help people quit smoking, but early evidence suggests that it works. According to a 2012 study by the Canadian Cancer Society, the reach of a social media campaign helped 32% of participants in the study quit smoking successfully compared to 14% using a more traditional telephone method, Smokers’ Helpline. Of course, the success of this study had a lot to do with reaching a younger, more internet savvy audience. 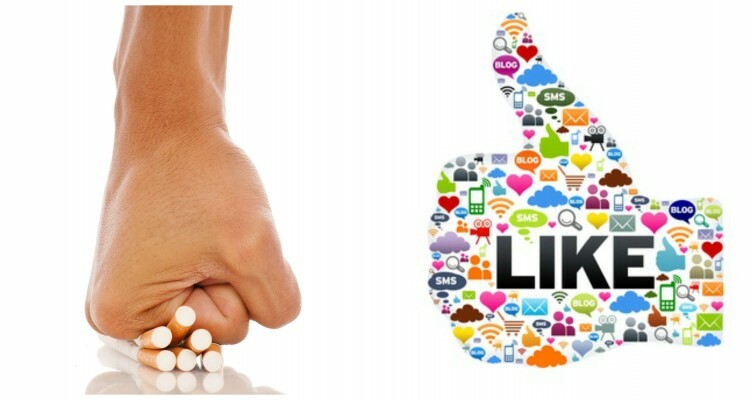 Nevertheless, the study showed that social media/digital forms of communication can function as a complement to already established support networks for those seeking to quit cigarettes. Recently, WHO reported that approximately 22% of the world population in 2010 partook in a habit that is still shown to be the biggest cause of preventable death in the world. Although the number of smokers is falling, what will these numbers look like after we factor in the continued efforts of promoting smoking cessation through social media? It is safe to say that it can only help continue the fall in the number of smokers by having new, additional methods of support for people who want to break the habit of smoking. If social media can be used to communicate the dangers of smoking to a larger audience, the same can be said for the healthcare industry overall. For example, if a patient in a well-known medical facility rightfully complains about the doctors or staff on his social media accounts, then all of his followers will know and possibly pass the word on to their own respective followers. Although this can hurt the reputation and bottom line of the facility in question, it will also hold the hospital accountable for their choices. How does the healthcare facility change in response to the patient’s actions? More broadly, how do we all change our health habits when the choices we make are held under a very loud, digital microscope? Furthermore, what can individuals and healthcare experts learn using all the information available to us in our newly connected world?